If you’re anything like me, you have trouble finding fun and unique wrapping paper at the stores. Plus, it’s always fun to mix it up and use a lot of different kinds of wrapping paper for different gifts and occasions. There are so many great free printable wrapping papers that creative bloggers have shared online to wrap your little gifts in style. Since most of them just print onto a regular piece of letter sized paper, these printable papers work best for very small gifts like a jewelry box. I especially love this color-blocked printable geometric wrapping paper shared by the talented Jinny of Something Peach. 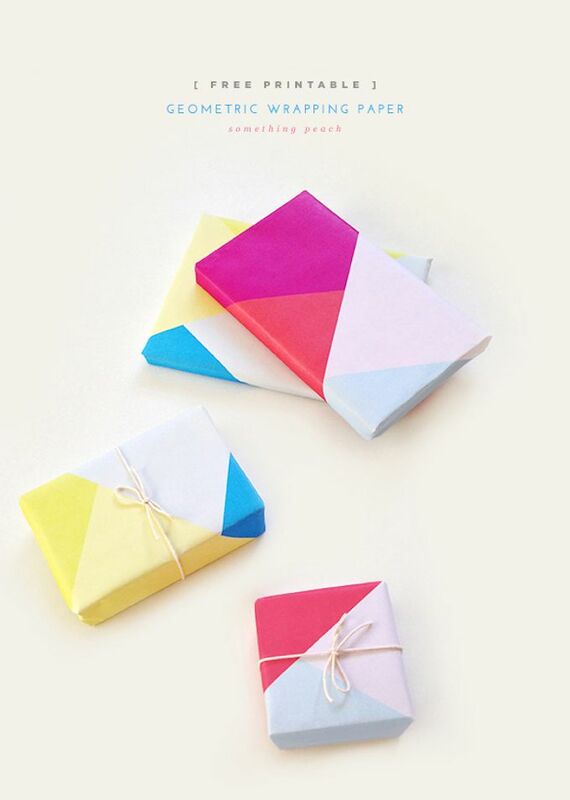 The colorful hues and angular shapes are a great change from bland store-bought wrapping paper. To use this beautiful paper, first visit Something Peach and click on the link that says template. You can then print the two papers directly from there. If you want, you can also right click on the image and click save as. After you’ve saved the PDF, you can open it on your computer and print from that program. Then just wrap your little gifts as you normally would.